This website is dedicated to quilters, rug hookers, papercrafters, and other creative crafters looking for retreats where you can relax, have fun, and work on all those wonderful projects that you just don't have time to finish otherwise! 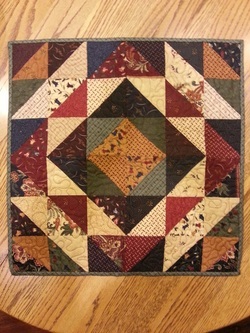 A small quilt made by Sally at one of our retreats! Join us at one of our fabulous, fun-filled retreats! Grab some good friends, your UFO's, all your supplies, and get going! Woolen Willow Retreats hosts retreats each year dedicated to all styles of handicrafters. Simply click on one of the tabs at the top of the page, and begin your retreat planning! If you have any questions, please email Sally Cox, retreat coordinator, at woolenwillowretreats@yahoo.com.